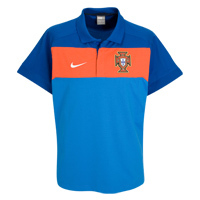 Official 2010-11 Portugal Nike Travel Polo Shirt for the 2010 World Cup Finals. Official Portuguese training wear for the FIFA World Cup. Available in sizes S, M, L, XL, XXL.